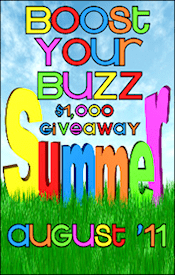 Enter the Boost Your Buzz $1,000 Giveaway! One lucky person is going to win $1000 USD paid via Paypal! Participants will follow various social media accounts of different companies/blogs (ie. Google Friend Connect,Facebook and Twitter) to gain entry into the giveaway. One entry for each blog/business they follow/like/subscribe, etc. Gain entries in this giveaway by following Heck Of A Bunch by email subscription, following on Twitter, or following on Google Friend Connect. The giveaway starts August 1st 12 am EST and will run until August 15th 11:59 pm EST and is open worldwide. I received no compensation for this post. My blog is part of Boost Your Buzz and I paid a fee to be included. Please do your own research before purchasing products or using services. Your opinions and results may differ. I am a new GFC follower. Visit my daughter and I at our blog, Says Me Says Mom (http://saysmesaysmom.blogspot.com) where we talk about anything and everything.